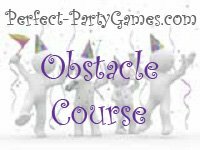 Summary: Obstacle course is where you have to go through a course with a balloon inbetween you and a teammates foreheads. Set up the course with the obstacles you have gathered. The teammates must keep the balloon between their foreheads, or any other part of their head, while running through the course you have set up. They may not touch the balloon with their hands, or let it drop to the ground. The team with the fastest time wins. Each player works independently and runs through the course, picks up a balloon, ties it off and runs back through the course. When the player gets to the end of the course, they pop the balloon to signal the end of the race. The best time wins.